Venezuela's President Nicolás Maduro sings the national anthem during an anti-imperialist rally for peace, in Caracas, Venezuela, on Saturday. Clad in a dazzling white shirt, Nicolás Maduro is standing at a podium, grinning through his mustache and waving his hands at his supporters. "Hands off Venezuela, Mr. Imperator Donald Trump!" he shouts, waving his hands still more, to emphasize his point. "Get out of Venezuela, imperial Yankee!" Cameras from state-run TV pan across the crowd, carefully picking out people who are applauding and flourishing flags. Many among the thousands gathered before Maduro are cadres from Venezuela's socialist party, brought by bus into the country's capital of Caracas for yet another choreographed rally in support of their beleaguered president. Some belong to a small minority who still genuinely support him. Two months have elapsed since the Trump administration threw its weight behind a multipronged campaign to oust Maduro, after an economic collapse that has led more than 3 million Venezuelans to move abroad and created widespread hunger and shortages. Since then, Maduro — who is fond of comparing himself to a boxer in the ring — has been absorbing one body blow after another. More than 50 nations, including the United States and most of Latin America, concluded that Maduro's re-election last year was a fraud. 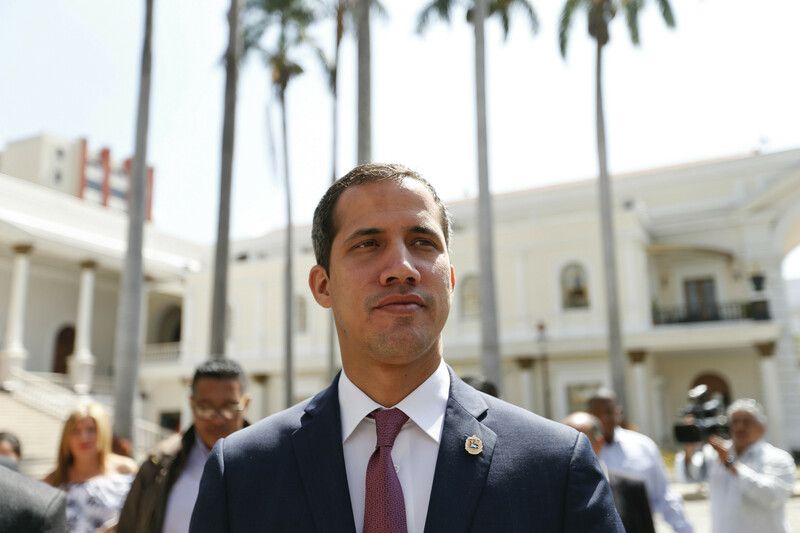 They have recognized Juan Guaidó, president of the opposition-led National Assembly, as Venezuela's legitimate head of state, endorsing his mission to establish a transitional government and hold fresh elections. Washington has imposed oil sanctions that deprive Maduro's government of a large part of the hard currency revenues upon which it depends for most of its income. Nearly three weeks ago, out of the blue, Venezuela was hit by the most severe power outage in its history, which left millions of already impoverished people without light, fuel, water, refrigeration, public transport and hospital treatment for up to six days. Maduro blames the blackout on U.S. sabotage; Washington cites Venezuelan government corruption and ineptitude. The results were deadly: At least 20 people died because dialysis equipment was out of action, according to CodeVida, a nongovernmental organization that monitors health. Yet, somehow, Maduro remains in the ring — still on his feet, on TV in front of a crowd, cheerfully goading his enemies. Maduro's adversaries had hoped for success by now. They are beginning to ask what else they and their international supporters need to do to topple him. "It's true we are running out of options," says Juan Andrés Mejía, an opposition member of the National Assembly. "I do feel that my role is getting to a point where it's no longer useful." Venezuelan opposition leader Juan Guaidó, who has declared himself interim president, goes to the National Assembly for a meeting with a coalition of opposition parties and civic groups in Caracas on March 18. At 32, Mejía — like Guaidó, who is 35 — belongs to a coterie of young Venezuelan democratic politicians who have spent their lives working to oust Maduro and before that his mentor Hugo Chávez, the late former president who launched a self-styled socialist Bolivarian revolution in 1999. "I am trained for that," says Mejía. "However, I am not trained to take up arms and fight against a trained army. "That time may come, and it won't be my time. It will be the time of others. I pray that we can find a different solution before that. But it is true that we cannot avoid talking about this at this point." Mejía is quick to reply when asked why he thinks Maduro is still in power: "He holds power because he has the support of a group within the military. Anywhere in the world, that is called a dictatorship." No one doubts that Maduro would fall if the men in charge of Venezuela's armed forces withdraw their support. Some heavy hitters on the world stage continue to back him — notably China, Iran, Turkey and Russia. This weekend, Russia flew two planes to Caracas, reportedly carrying Russian military personnel and supplies. The U.S. State Department condemned the deployment as a "reckless escalation of the situation," Reuters reported. Yet there is a consensus that if Maduro loses his generals at home, it is game over. Fractures have appeared in the lower ranks. These grew markedly after an opposition attempt on Feb. 23 to deliver 280 tons of humanitarian aid, much of which the U.S. parked on the Colombian border, hoping Venezuela's security forces would disobey orders to block it. That effort failed, but according to Colombia's Foreign Ministry, about 1,000 Venezuelan police and soldiers have recently crossed the border and handed over their weapons. Yet Venezuela's military high command has remained loyal, despite Guaidó's offer of amnesty to armed forces that abandon the government. 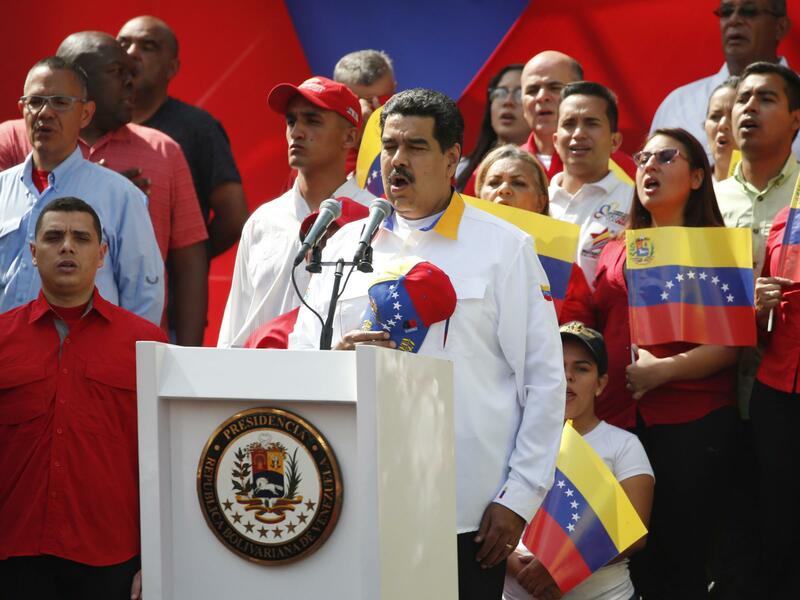 Maduro's opponents explain the continued support by saying senior army commanders pocket millions from illicit black-market activities, including food and currency rackets and narcotics and gold smuggling. Venezuelans also frequently attribute their generals' dogged loyalty to the role played by Cuba, Maduro's closest foreign friend. "I believe [the Cubans] are the real power in Venezuela right now," says José Toro Hardy, an economist and oil expert who is advising Guaidó's team on transition, should he assume power. Large numbers of Cuban agents operate within the Venezuelan military, monitoring the ranks for signs of betrayal. Toro Hardy does not believe the military's top ranks have faith in Maduro's government, but he says: "I believe they are very afraid of the Cubans, because they know Cuban intelligence is watching over their shoulders all the time." The National Assembly voted to block the government's long-running shipments of heavily discounted oil to Cuba, in the hope this will encourage the Cubans to withdraw their spies. But the state-run oil company is not expected to abide. As Guaidó's U.S.-backed campaign to assume power enters its third month, Maduro appears to be stepping up the use of force against his opponents. Last week, agents from Venezuela's intelligence service raided the home of one of Guaidó's closest aides, a lawyer named Roberto Marrero, and detained him. Maduro's information minister, Jorge Rodríguez, is accusing Marrero of being part of a "terrorist network" planning to assassinate the leaders of the Bolivarian revolution — a claim dismissed as nonsense by the opposition and its allies. Maduro and his government are "surviving through terror because they want to maintain a narcostate," says Jaime, 45, an accountant who spoke to NPR inside a multistory parking garage to avoid being seen by the authorities. Like many Venezuelans, he declines to give his full name for fear of reprisals. After Venezuela's huge power outage, Maduro called for the mobilization of colectivos, an armed pro-government motorcycle militia with a reputation for using extreme violence. This worries Jaime. "The fear is that they will kill you. They shoot at you and there is no law that defends you, because they are the government's system for terrorizing people and stopping protests," he says. "They are stronger than the police." Many Venezuelans feel the same about other security forces: Thirty-seven people were reported killed in Caracas during house raids in January by the national police's special force, according to United Nations High Commissioner for Human Rights Michelle Bachelet. Most of the victims were from poor neighborhoods and were suspected of participating in anti-government protests, she said. "I am a communist since I was in my mother's womb," says Alejandro, 65, a retired member of Venezuela's National Guard who is among Maduro's dwindling band of supporters. He lives in poverty in a crumbling house in Los Teques, a town about 20 miles west of Caracas. He and his family of 10 depend partly on heavily subsidized government food boxes. Any mention of Maduro's rival, Guaidó, draws a contemptuous response. "He means nothing to us," says Alejandro. "I'd throw him in jail and leave him to rot. He's a puppet of the U.S."
Many Venezuelans believe — and often hope — the U.S. will lead a military intervention that will finally drive out Maduro. That conviction is reinforced by the Trump administration and Guaidó: Both regularly emphasize that "all options are on the table." Yet the idea is widely opposed in the international arena, and there is little sign of enthusiasm for it in Washington. Even so, Alejandro says Maduro's foot soldiers are ready. "Let [the Americans] come. The thing is — how will they get out?" If you press him about why he still supports Maduro, despite his nation's economic catastrophe, Alejandro concedes that Venezuela "has problems." But, he says, "Nicolás will continue, because it is his mission. "This is the task Chávez gave him. There's no one else." Maduro's hard-core support is small: just 14 percent, according to a February survey by the Caracas-based polling company Datanalisis. Guaidó scored 61 percent. The same survey included another striking statistic: Forty-seven percent still support Chávez, who died of cancer in 2013. "Almost half of our population still think that Chávez was a good president," says Luis Vicente León, head of Datanalisis. "Maduro is destroyed in terms of popularity — not Chavismo. A lot of Chavistas don't like Maduro, but they like the Chávez legacy." León cites this as evidence that in the long term, the Chavistas could eventually make a comeback in Venezuela, "even with transparent and clear elections." Maduro now faces an even tougher test. Blows are raining down on him, as he dodges and weaves in an effort to somehow keep his broken economy running. The oil sanctions the U.S. imposed on Venezuela in late January are making an impact. With the world's largest proven oil reserves, Venezuela's production dropped by 142,000 barrels per day from January to February, according to OPEC. That is far below Venezuela's output from a few years ago. The industry's infrastructure is falling apart; many thousands of engineers have left; the state-run oil company finds it increasingly difficult to import diluents needed to raise Venezuelan crude to export grade. The Maduro government is scrambling to find fresh clients for crude oil that it is no longer exporting to the U.S. The fact that Maduro has survived thus far is a "complete mystery," says Toro Hardy, the economist and oil expert. "Maduro is like a plane without fuel. He cannot fly anymore. ... Unfortunately we, the Venezuelans, are all passengers on that plane," he says. Despite this, it is far from certain Maduro will fall. That concerns rights groups, which fear U.S. sanctions are deepening the hardship of a long-suffering population and weakening their ability to organize against Maduro's government. Crashing an economy alone does not always bring a government down. Pollster León recalls: "Everyone thought the same with Cuba, Iran, Syria, Zimbabwe and North Korea."